We have been so busy focusing on the refreshed exterior of the 2019 Chevrolet Camaro in every trim and the addition of the new 10-speed automatic transmission to the Camaro SS that we skimmed across the arrival of the Turbo 1LE package. For the first time, the entry-level Camaro can be outfitted with the premium handling package, bringing these high performance bits to those buyers looking to keep the price low. The modern 1LE package was introduced during the 5th generation of the Camaro and it was offered strictly on the SS models. With the arrival of the 6th generation Camaro, the 1LE package was expanded to include the V6-powered Camaro and the supercharged ZL1, in addition to still being offered for the SS models. This modern 1LE package makes the 6th gen Camaro in V6, SS and ZL1 form the best-performing vehicles to wear the name, helping the ZL1 set a new record for the quickest lap time around the Nurburgring by an American muscle car. For 2019, the turbocharged 4-cylider models are also available with the 1LE package, offering new levels of performance to the entry-level Camaro. The 2019 Chevrolet Camaro Turbo 1LE starts with the 4-cylinder turbocharged engine with 275 horsepower and 295 lb-ft of torque being sent towards the rear wheels by means of the 6-speed manual transmission (the automatic transmission is not available with the 1LE package). Most notably, the new Camaro Turbo 1LE has an ideal 50/50 front-to-rear weight distribution, with a spread of key handling upgrades. The 2019 Camaro Turbo 1LE package begins with the FE3 suspension setup, featuring larger front and rear stabilizer bars, uniquely-tuned dampers, stiffer rear cradle bushings and cross-axis ball joints in the rear tow links. Next, the package gets lightweight wheels wrapped in summer performance tires, measuring 245-40-20 up front and 275-35-20 out back, with the Brembo brakes tucked behind all four wheels. Finally, the Turbo 1LE adds the Driver Mode Selector system with Sport Mode, Track Mode and Competition Mode, along with helpers such as the performance instrument gauges, launch control, a built-in shift light and a suede-wrapped, flat-bottom sport steering wheel. Recaro seats are available, for those who want to add an extra touch of race-readiness. 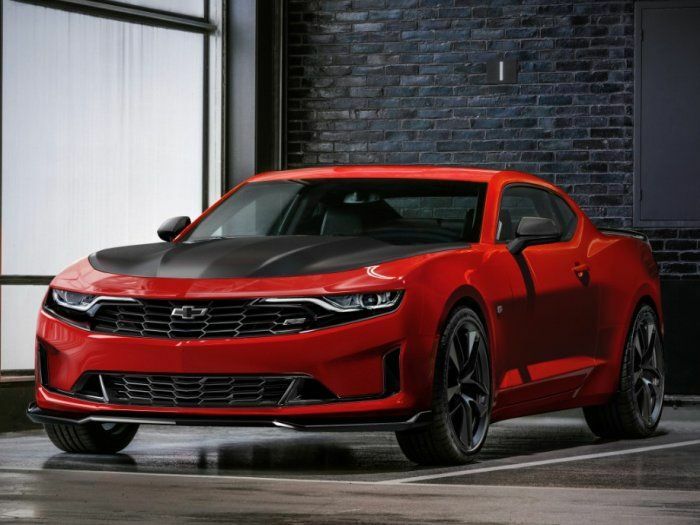 Of course, like the other 1LE models, the 2019 Camaro Turbo 1LE has a contrasting matte black hood, along with the new look of the 2019 model year.